Indoor air is known to have up to five times more contaminants than outdoor air. To make sure the air your family breathes is pure and fresh, add one of our air cleaning systems to your home. The filters in our systems are highly effective at removing allergens, contaminants and household dust. 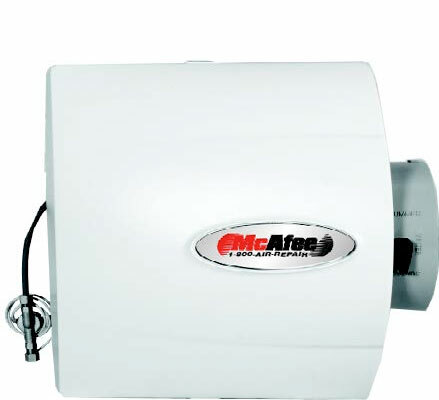 McAfee carries a wide variety of high-efficiency replacement filters. From humidifier panels to one year air filters, we have the product that’s right for you. Did you know that the air in your home during the winter can be more dry than the air in Death Valley? That can be rough on your body because it dries out your skin and makes your family more susceptible to illness. One solution is a whole-house humidifier. Our systems help maintain humidity between 35 and 50%, even in the driest weather. You’ll feel warmer and more comfortable all winter long. Installing a power exhaust fan for your attic can lengthen the life of your roof, and reduce your home’s cooling cost by up to 30%. By removing the hot air in the attic the air conditioners do not have to run as often. Power exhaust fans can lower a home’s temperature as much as 3 to 8 degrees. Low levels of CO, over a prolonged amount of time, can buildup in your bloodstream and lead to chronic, permanent physiological and/or neurological damage. We offer low level CO detectors to bring you peace of mind.